An easy-to-understand synopsis of identification systems, presenting in simple language the process of fingerprint identification, from the initial capture of a set of finger images, to the production of a Rapsheet. No other single work exists which reviews this important identification process from beginning to end. We examine the identification process for latent (crime scene) prints and how they are identified with these systems. 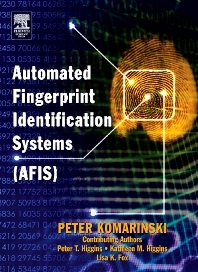 While the primary focus is automated fingerprint identifications, the book also touches on the emergence and use of fingerprints in other biometric systems. Criminal justice administrators, policy makers, and students of forensic science and criminal justice will find a reference to the known limitations and advantages of these systems. This book provides information as to the critical and continual need for properly trained individuals as well as an understanding of the direct and indirect costs associated with maintaining these systems. An understanding of the entire system and what it means will prove invaluable. Why are there missed identifications? Why are identifications made on one database that are not made on another database? Key terms and issues are included, and well as suggestions for improving the overall number of identifications. The book will go beyond process and also discuss issues such as interoperability, management strategies for large databases, contract development, lights out verification and several other issues which impact automated identifications. The future of AFIS will is discussed, including national standards in developing multi-agency cooperation/interoperability (U.S.) in addition to the use of AFIS identification world-wide. AFIS/ Biometric policy makers, AFIS vendors, new markets interested in using biometric and fingerprint identification including airports and computers vendors (in the biometric access control community). Peter Komarinski is a Criminal Justice Policy Analyst with the New York State Division of Criminal Justice Services. He has a Master’s of Arts (Criminal Justice) and over his 30-year career has worked with a variety of criminal justice agencies including law enforcement, corrections and policy planning. Mr. Komarinski was part of the team as New York State initiated a five million record AFIS system in 1987. His AFIS responsibilities include testing all new releases of software, latent print training using AFIS, and applying management practices to the identification process. He has published and lectured extensively on Automated Fingerprint Identification Systems to such groups as the New York City Police Department, New York State Police, Investigator Courses. He is a regular presenter at the annual meeting of the International Association for Identification. He has held positions on the AFIS Committee of the International Association for Identification and has served as Chair of that Committee. His lectures include: Management Challenges to AFIS Interoperability, Improving Identifications through the Unsolved Latent Print File, Statistical Analysis of Identification Rates. Mr. Komarinski has received numerous awards and certificates including: the New York State DCJS Director’s Certificate (Twice), the New York State Workforce Champion Award, the Sagem General Award, and named a Friend of Law Enforcement by the New York State Sheriff’s Association. Criminal Justice Policy Analyst, New York State Division of Criminal Justice Services (Ret). Chair, AFIS Committee, International Association for Identification. Biometric Consultant.